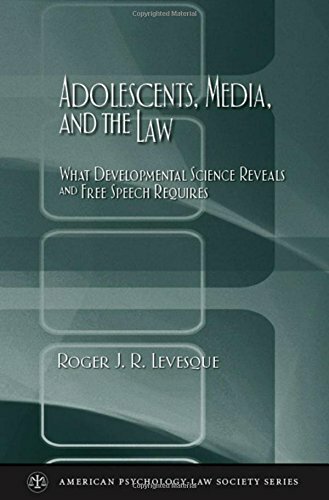 [PDF] Adolescents, Media, and the Law: What Developmental Science Reveals and Free Speech Requires (American Psychology-Law Society Series) | Free eBooks Download - EBOOKEE! Description: There is much controversy about the dangers of a free media when it comes to children and adolescents. Many believe that this constitutional right should be amended, altered, or revoked entirely to prevent the young from being negatively influenced. Graphic violence, sexual content, and the depiction of cigarette smoking have all come under fire as being unacceptable in media that is geared toward adolescents, from television and movies to magazines and advertising. Yet not much has been written about the developmental science behind these ideas, and what effects a free media really has on adolescents. This book presents a synthesis of all current knowledge about the developmental effects of a free media on adolescents. Levesque first presents a full analysis of research studies into the media's effects on adolescents in four key areas: sexuality, violence, smoking, and body image. All findings are assessed within the context of normal adolescent development. Levesque then discusses how this knowledge can be used to inform current standards for the regulation of free speech with regard to adolescents. Both legal restrictions and less formal regulatory bodies (schools, parent groups, etc.) are reviewed to present a full picture of the ways in which a free media is constrained to protect adolescent's development. No comments for "[PDF] Adolescents, Media, and the Law: What Developmental Science Reveals and Free Speech Requires (American Psychology-Law Society Series)".